If you’re looking for a parking lot contractor in the Grand Strand you’ve come to the right place. King Construction Services has spent years honing our experience to provide businesses across South Carolina with parking lot paving and repair focused on ensuring long-term service. 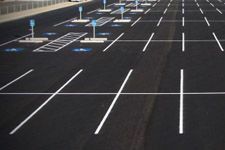 With our professional approach to your parking lot, whether you are investing in paving or preventative maintenance and repair from King Pavement, you save yourself from the hassle of more serious repair and re-paving in the future. We may not be the cheapest option, but for good reason. No matter how large or small your parking lot, we ensure you get the most value for your money. Your parking lot will hold up against wear and careless drivers, and you will spend less on repairs and maintenance.